Are the coaches in the White Pass & Yukon, and East Tennessee & Western North Carolina passenger Sets the same units as the Jackson Sharp coaches that are sold individually? The coaches in the sets usually have plastic railings and battery powered lights; otherwise, they're the same. Oh well, I converted it to track powered LED's. At the same time, I made about five other modifications to them. Now to get the metal railings for my other dozen J&S cars! 90059 WP&Y 240 2007 P-Obs White Pass & Yukon "Lake Bennett" Plas railing Not Lighted Set Car plastic railings same as earlier car except has no lights. The cars in set 90059 are not lighted as per the "The Favorite Spot" hobby shop which has an Ebay Store. I do not have a second confirmation on this. The following are the 97 series cars: They have Battery power except as noted, and have plastic railings. The above info is based on my researc so far and may or may not be totally correct, if anyone has better info or corrections please email me, or send me a personal message. If you are buying on EBay be sure of what you are getting!!!!! Ask questions!!!! Good Luck and Enjoy your Large Scale Trains! Now that Bachmann has started selling the J&S coach kits again, what's the chances of getting those metal end rails as replacements? The cars with them look really great, and make the fat yellow plastic ones look really goofy. Ozark Miniatures sells Part # 88 "Coach Platform Railings for Bachmann Jackson & Sharp Coach". See their website or various vendors that carry the line. 89094 & 89092 .From the ads they have track power lighting and metal railings..How much difference is there in detail to justify $180.00 price asked for by the other mfg. They are a different scale. It's like comparing apples to oranges. I checked out the website but they did not have a comparison .There is nothing I saw to justify an addditional $135.00 or so extra for the Accucraft coaches.In fact the purchasers of the coaches were sending them out for what I consider were repairs. You can't compare the Bachmann J&S coach to the Accucraft coach any more than you can compare Bachmann's original 1:22 freight cars to their new "Spectrum" 1:20.3 cars. They're in two completely different leagues. The fidelity to detail is top drawer on the 1:20.3 equipment, where on the older 1:22 stuff, it's far, far coarser--more of a suggestion than an accurate representation. Worth the price? Depends on what you want to get from the model. If you're not "into" 1:20.3 as a scale (and the high level of detail the scale's followers demand), then the Bachmann cars will be just fine. They look fantastic with the Bachmann 4-6-0, and with locos from LGB, Hartland, and the Aristo/Delton C-16. I used to have a string of them myself. However, they are NOT 1:20.3, and not visually compatible with any of Bachmann's Spectrum locos with the possible exception of the small-in-stature 4-4-0 or possibly the 0-4-0. They're easily dwarfed by anything larger. Don't even think they'll look okay behind the K-27. The opposite is also true, though. The Accucraft cars will dwarf any LGB loco ever made. 1:20.3 equipment is really in its own class as far as size goes from the historic 1:22 and 1:24 offerings of years ago. Most folks who model 1:20.3 do so because they have an interest in scale fidelity and value a high level of detail. There's a distinct reason Bachmann put so much effort into making prototypically working door latches on their new box cars. The 1:20.3 crowd demands it. Those added details cost money, so the price goes up accordingly. Those of us who value that attention to detail don't seem to mind paying for it. It's still easier (and cheaper) than scratchbuilding, and when you compare the cost of even the "expensive" equipment compared to what we were paying 25 years ago for stuff with less detail than Bachmann's inexpensive line, it's even more of a bargain. ... for what I consider were repairs. Suffice to say, that's not a problem unique to Accucraft. But like that similar example we're all familiar with here, the cars are beautiful, and despite a few minor easily remedied glitches, well worth the purchase price. I must be missing something. In the first picture you reference, the Accucraft Coach is clearly taller than the LGB - not the other way around as you suggest. The Bachmann coaches are virtually identical in size to the LGB coaches in terms of height and width, actually the roof on the Bachmann car is just a touch taller, owing to a taller clerestory. 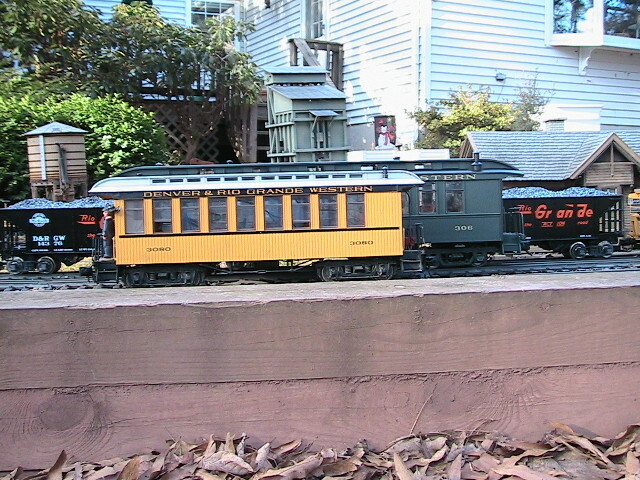 The Bachmann coach is a bit longer, though not by much--maybe an inch or so. I used to have a photo of a passenger train on my dad's railroad consisting of three LGB coaches and a Bachmann car that I modified into a business car bringing up the rear. Naturally, it's nowhere to be found when I want to illustrate a comparison.